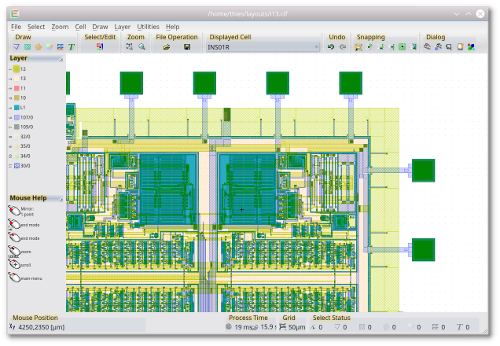 is the most popular software to edit designs for MEMS and IC fabrication. It is also often be used for Multi-Chip-Modules (MCM), Chip-on-Board (COB), Low temperature co-fired ceramics (LTCC), Monolithic Microwave Integrated Circuits (MMIC), printed circuit boards (PCB), thick film technology, thin film technology or any other technology using photomasks. The LayoutEditor can freely be used to access our services like the supplier with photomasks. Give it a try and be prepared to be impressed! Boolean Operations, Barcodes, Fracture, Design Rule Checker, SchematicDriven layout, background images are available next to the basic editing feature. A schematic editor, 3d viewer and interfaces to autorouter, extraction tools, circuit simulators, photomask service are integrated in the user-interface. A cleverly worked out user interface provides outstanding usability on the one hand and high productivity on the other. This virtual challenge is solved by the extensive use of shortcuts and mouse button/key combinations together with clear display of these combinations. The most important handling functions like zooming and scrolling are integrated into each feature and need not be called up separately.